Today is the last day of March. It’s opening day, with the first pitch of the season being thrown in ball parks across America. All signs point to spring, right? Yesterday I didn’t believe it when I heard that snow was forecasted, but it happened. This morning (veeeery early this morning) when I went to boot camp there was frost on my windshield. I refused to scrape it off in protest of the late-March frost. And guess who has a very wintery cold? Meghan. At her check up on Tuesday, the doctor said, “Looks like she’s getting a runny nose.” I didn’t think too much of it, but by Tuesday evening she was coughing and yesterday it was clear that she’s definitely got a cold. As if I needed something else to remind me that spring has not made it’s way to southern Ohio just yet. There is conflicting research as to whether loading up on Vitamin C at the onset of a cold actually helps or not, but I figure it sure can’t hurt. So I decided to make her breakfast smoothie loaded with fruits high in Vitamin C; I call it the Vitamin C Fruit Smoothie. This makes two smoothies and covers 100% of an adults’ vitamin C needs for the day! 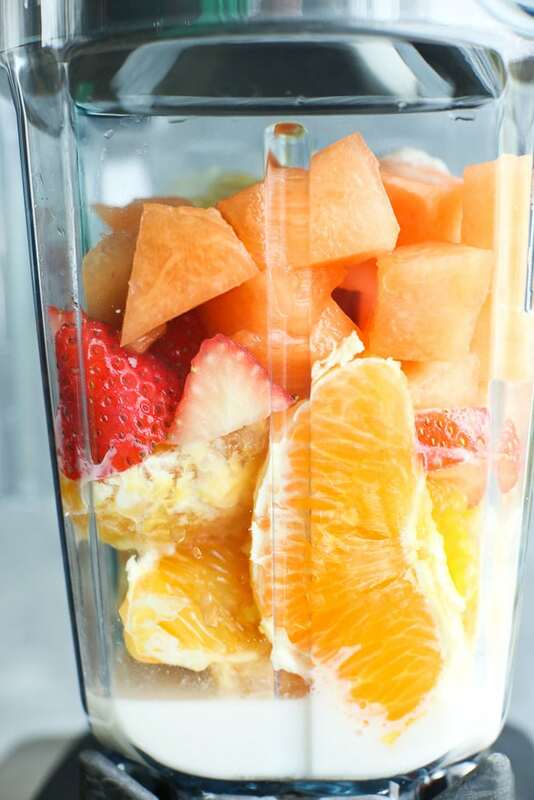 Even if it doesn’t help to shorten her cold, these fruits make one delicious smoothie. this smoothie made Meghan smile. And she had no problem finishing it. She also had a piece of peanut butter toast for some added protein. Now let’s just hope that vitamin C works its magic and this cold doesn’t overstay its welcome like winter has. Question: Do you think loading up on vitamin C at the beginning of a cold helps, or do you think that it’s just an old wives’ tale? 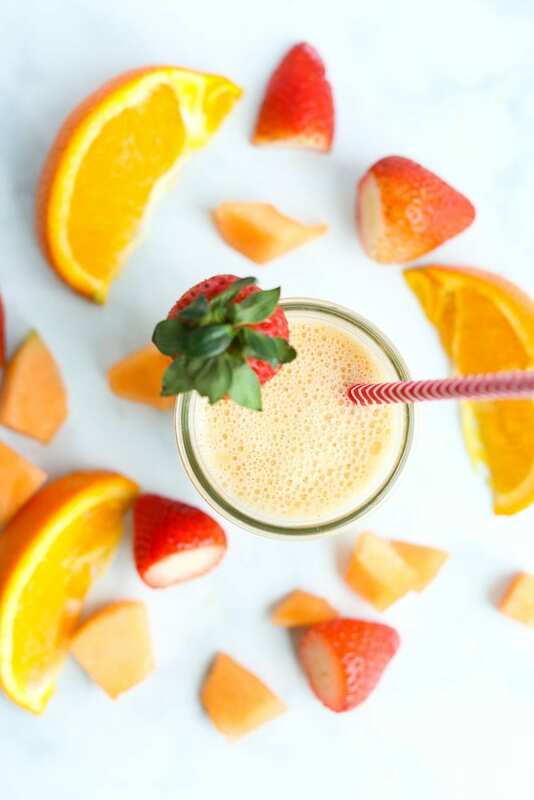 If you make this Vitamin C Fruit Smoothie recipe, or any Happy Healthy Mama recipe, I would LOVE to see it! Please take a pic and share it on Instagram or the Happy Healthy Mama Facebook page and tag me @happyhealthymama ? I think it’s helped me when I have a cold or when I’m sick. It seems to lessen the amount of time I’m sick. Could be all in my head though…It’s just what I do. We swear by it! Everytime one of ours starts to even appear sick we fill them up with Vitamin C. We feel like it works! Her smile makes me smile! It’s Natalie’s birthday today and I always want to plan a Spring party but each year I’m reminded why it’s still the time of year to plan an indoor one. Yummy looking smoothie! 🙂 I have no idea if it helps or not, but I try to load up on the vitamin C when I’m sick. My husband swears it helps but I’m not sure. I figure it’s not going to hurt you though 😀 Hope your little one feels better soon! It can’t hurt, right? We might try this smoothie tomorrow with some papaya. Trying papaya for the first time. Well, that’s not entirely true. I’ve tried it before and hated it. So, I’m hoping that my tastes are more grown up now. Plus, I hate to deny my kids something that they may end up loving. I don’t recall ever trying papaya, but maybe I have. Let me know how the smoothie is with it! I totally agree that we should try not to pass our taste preferences on to our kids. That’s a tough one though. I think I need one of those smoothies. I have a sore throat. Hope Meghan feels better soon. Oh, no! That doesn’t sound fun! I hope the ENT visit goes well. I believe that Vitamin C is very helpful to take, especially at the onset of a cold. If used diligently daily, it is good for preventative measures. She doesn’t look like she’s feeling too bad with that smoothie in front of her. So cute. I need to make this ASAP! I’ve been guzzling orange juice like it’s nobodies business trying to fight this cold! I definitely think it works! My son gets colds from time to time (yay daycare). I need to start feeding him smoothies. It can’t hurt, so I always up my intake when I feel something coming on too. Same for the kids. Luckily Vit C is in so many tasty fruits, it isn’t that hard to get the kids to increase their dosage. i think it does work, to a point. 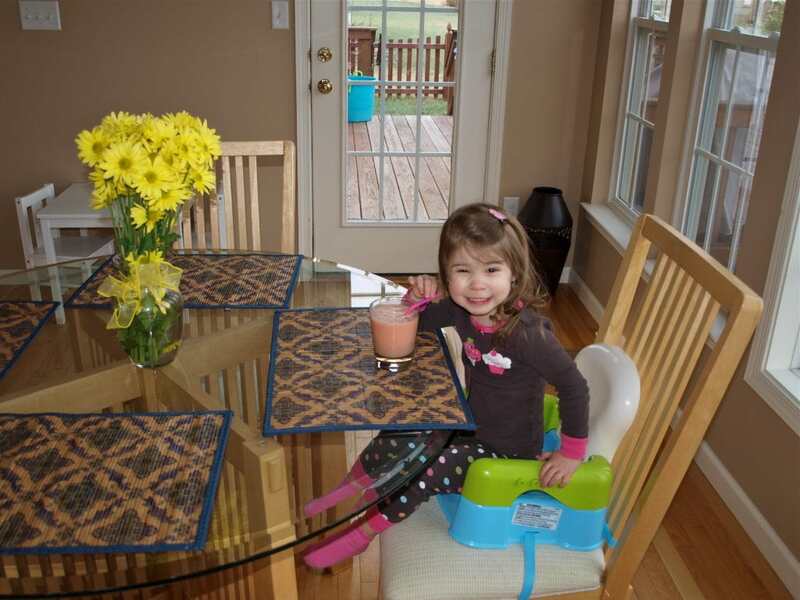 def going to be making a vitamin c rich smoothie…eva has another runny nose too! i sure feel for you with your crazy weather! i can’t imagine living with that much snow! hang in there,,,spring is around the corner! 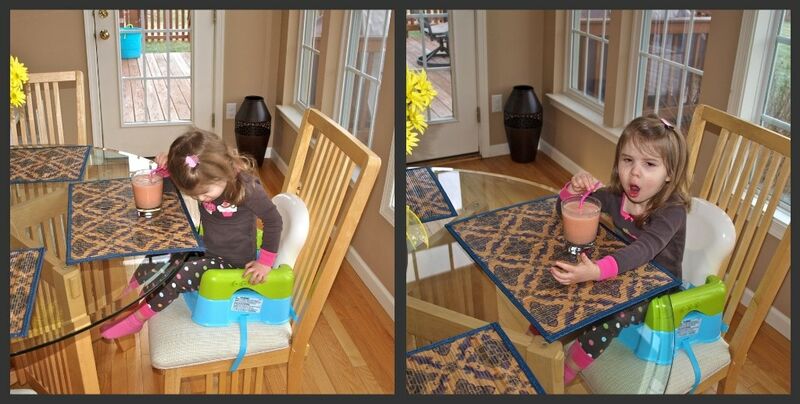 Looks yummy – my DD24 who still lives at home really enjoys smoothies – Making note of this recipe for her. Hope your kiddo feels better soon! Thanks for visiting from the UBP! 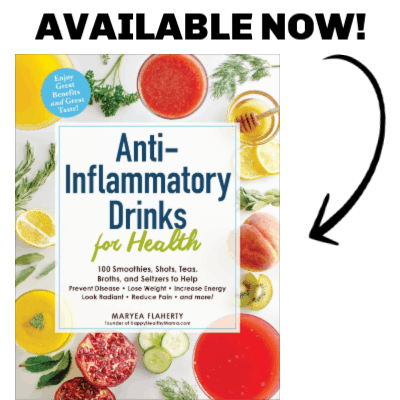 I loved this recipe so much that I featured it on my best of post, 27 HEALTHY Smoothie Recipes’. 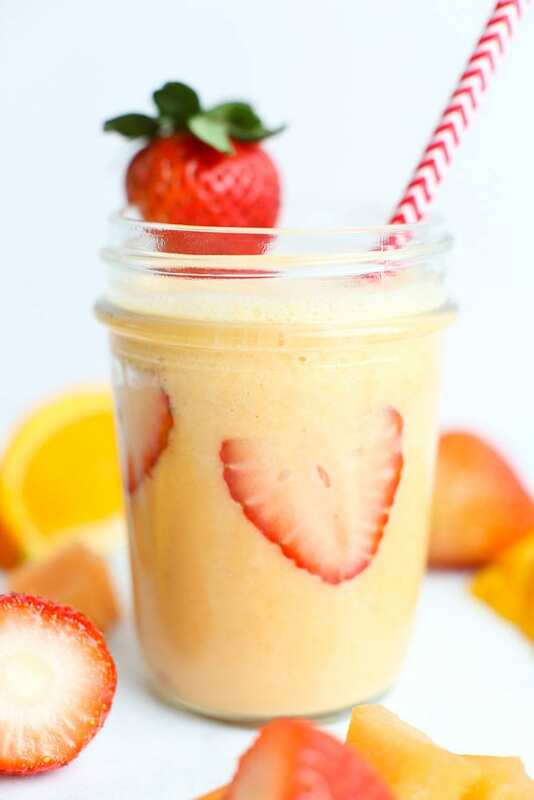 I loved your Vitamin C healthy smoothie recipe so much that I featured it on my best of post, ’27 HEALTHY Smoothie Recipes’.